Pittsburgh has joined the list of cities with community benefits agreements. The plan is moving forward after the Pittsburgh City Council gave its blessing to the agreement, which was signed by several public entities as well as community groups and a private company. The One Hill CBA Coalition negotiated the deal with the owners of Pittsburgh Penguins hockey team, as well as the City of Pittsburgh, AlleghenyCounty and the county Sports and Exhibition Authority. The $750 million project includes a new arena for the Penguins and redevelopment of the arena where the team currently plays. Pittsburgh UNITED, a chapter of the Partnership for Working Families, played a crucial role in the coalition’s success by mobilizing allies from around the city. For instance, the group organized a bus tour for progressive allies and for members of the media to show them areas of the Hill that would benefit from a CBA. Ultimately, the media started talking about the importance of family-sustaining jobs, community involvement and giving workers freedom to organize. Local elected officials and the owners of the Penguins were originally resistant to the idea of a signed CBA. After months of public actions and press coverage, the Penguins and the elected officials had no choice but to bargain with One Hill. Subsequently, the final negotiations involved community leaders, County Executive Dan Oronato, Mayor Luke Ravenstahl and Penguins President David Morehouse. The CBA will involve the people who live in the Hill District in numerous ways and help to rebuild their infrastructure and economy. First, the Penguins and the city’s Urban Redevelopment Authority will each provide $1 million for a locally-owned full-service grocery store in the district. Additionally, residents will have access to a local employment center that gives district residents access to jobs created at the new arena and the redevelopment project that will pay $12 to $30 an hour. The CBA also calls for the creation of the master planning committee which sets forth development guidelines. 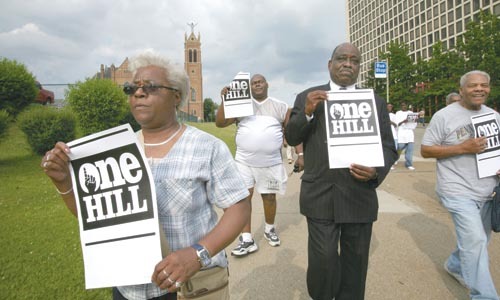 Along with the construction of a community center for youth, families and seniors, the Hill District will also see the creation of a Neighborhood Partnership Program centered on social services for the neighborhood. This entry was posted on October 1, 2008 at 7:41 pm and is filed under Community Benefits Agreements, Job Quality Standards, Jobs, Stadiums, Subsidies. You can follow any responses to this entry through the RSS 2.0 feed. You can leave a response, or trackback from your own site.